My Madison Bistro » Happy Easter! So I’m a day early, but in case you’re looking for an idea for an easy Easter breakfast, I wanted to share a simple recipe that’s easy to customize. 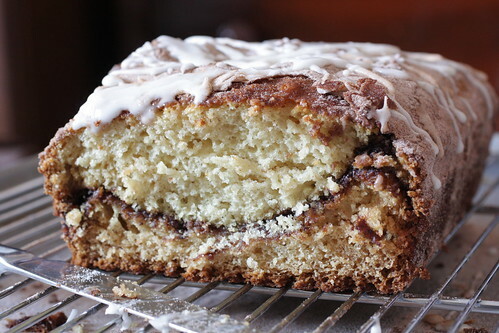 I happen to love the cinnamon swirl in this bread, but you can very easily substitute some orange zest and dried cranberries, lemon zest and blueberries (fresh or frozen – don’t thaw if frozen), orange zest and chocolate chips, almond extract with white chocolate chunks & dried cherries…you get the idea. Have fun, and/or simply use what you have on hand for a fast, easy breakfast. Or, if you’re like my family and going out to brunch on Easter, how about a slice of quick bread with a cup of afternoon tea or coffee? Preheat oven to 350*F (177*C). Grease a 9×5 inch (23×13 centimeter) loaf pan and line with 2 strips of parchment cut to fit the pan lengthwise and widthwise. Grease in between the sheets and on the top piece as well. Be sure to cut the parchment long enough to hang over the pan edges to make removal easy. In large bowl, whisk flour, sugar, baking soda, and salt to combine. Make a well in the center and set aside. Lightly whisk milk, egg, oil, and extract to combine. Pour into well and stir until just mixed into a batter. The batter will be lumpy and may still show a few streaks of flour. Pour 1/3 of batter to pan, sprinkle with cinnamon sugar, add another 1/3 of batter, sprinkle with sugar, then add remaining batter and top with cinnamon sugar. Press lightly on the top of sugar to adhere. Bake for 40-50 minutes, or until a cake tester comes out clean. Cool in pan on wire rack for 10 minutes, then remove from pan and cool completely before slicing. 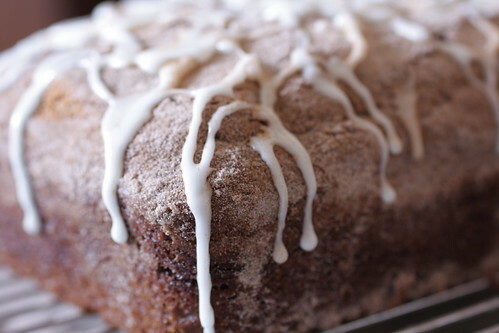 Drizzle with glaze. 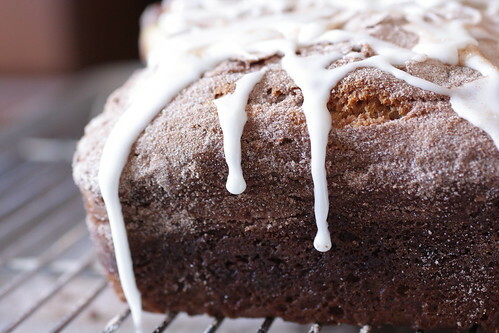 For the glaze: Slowly whisk confectioners’ sugar and half of the milk, adding more milk as needed to thin the glaze to the desired consistency. *To make soured milk, combine 1 cup milk (227 mL) with 1 tablespoon (15 mL) vinegar or lemon juice and let sit for 10 minutes. Happy Easter – the photo of your loaf cut in half looks like it is smiling at me :).